The Hollywood-based VR production company opened its doors merely 18 months ago (“Those first few stitches were really rough!” exclaims Celia.) and its client list already includes the likes of Google, ABC, GoPro, and the National Park Service. “We work on everything at the moment,” states Celia. “I think you have to in order to survive as a strictly VR-only production company, but everything we do has our brand of #storyfirst. People come to us when they are looking to add a little more narrative to their idea.” To help create and execute stories in this new medium, Light Sail relies on a small, talented team with years of traditional storytelling experience. “One of the largest challenges for us was figuring out how to make the audience feel like they are actually on a tour with Jordan Fisher. The last we wanted to do was simply drop a camera down and have him do a voiceover,” notes Celia. “It was important to us to make the audience feel involved. This led to some tricky shots such as hiking and kayaking, but I really think they add a ton to the piece.” To capture the shots they needed on the transportation-free islands, the Light Sail production team (alongside Townhouse, an integrated strategic 2D production company) travelled light using a ZCam S1 camera, the 360Rize Abyss with 6 GoPros, and SamsungGear360. 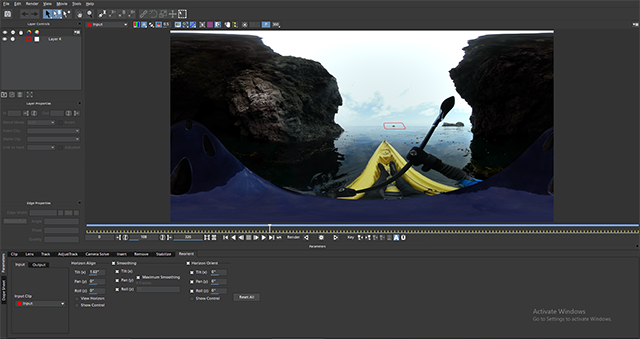 Once production wrapped, Light Sail turned to Mocha VR inside Adobe After Effects. “This was our first project using Mocha VR and it was very easy to pick up and use,” comments Celia. “Since we were often shooting from boats, we had a lot of stabilization to do. Mocha VR’s Horizon Stabilize tool is so intuitive and does a great job as long as there is something on the horizon to track to. It’s fast and provides great results.” The team also used the Lens Undistort to quickly paint out the tripod and shadows on appropriate shots. In addition to their work for the National Park Service, Light Sail recently completed another tourism-geared 360 video for Princess Cruises. “I see a lot of commercial work in the market,” Celia. “As we move to VR, we’re going to see a rise in interactive stories. We’d like to move into crafting more original narrative series, but I think it’s still easy days to get those projects to a budget where audiences will be satisfied with them.” The team is currently working on their first original interactive horror VR project. Learn more about Light Sail VR.